Barry Sanders was born on July 16, 1968 to William and Shirley Ann Sanders in Wichita, Kansas. He got his first crack at running back as a senior at Wichita North High School and was recruited as a kick returner by Oklahoma State University. During his first two years at OSU, Sanders was an understudy to future great running back Thurman Thomas. In his first full year as the starter at OSU, Sanders rushed for 2,628 years and 37 touchdowns and won the Heisman Trophy in 1988 for the OSU Cowboys. In the 1989 NFL entry draft, Barry was drafted in the first round, third overall by the Detroit Lions. Barry signed with the Detroit Lions and made his NFL debut at the Pontiac Silverdome against the Phoenix (Arizona) Cardinals. His first rush was gave a brief glimpse of what football fans were in for, when Sanders rushed for 18 yards. Though only 5'8, he had a stocky, strong and musclular 200 lb physique that would surpise defenders for a decade by dancing around or breaking through tackles. In his rookie year, Barry Sanders finished second overall in NFL rushing to Christian Okoye from the Kansas City Chiefs and was tied for second for rushing touchdowns. The following season saw his rushing numbers go down, but he made up by catching almost 500 yards of receptions. After the dropoff in rushing yards the previous year, Barry was back in form during the 1991 season rushing for over 1,500 yards and finishing behind Emmit Smith of the Dallas Cowboys. The Lions finished the that season with a 12-4 regular season record but lost to the Washington Redskins in the NFC championship game. The next couple of seasons saw Sanders rush for over 1,000 yards but he really broke out in 1994. He led the NFL with 1,883 rushing yards and a combined 2,166 yards from scrimmage. That season he was Associated Press Offensive Player of the Year. 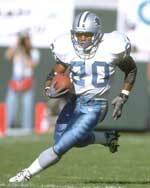 Barry Sanders followed this up with two more 1,500+ yard rushing seasons and had the "dream year" in 1997 when he rushed for 2,053 yards and added another 305 receiving for a whopping 2,358 total yards from scrimmage. At that time, this feat made him only the third player in NFL history to rush for 2,000 yards in a single season - the other two being Eric Dickerson of the Los Angeles Rams with 2,105 yards in 1984 and O.J. Simpson of the Buffalo Bills with 2,003 yards in 1973. Jamal Lewis would go on to surpass Sanders' mark in 2003 with 2,066 rushing yards as a member of the Baltimore Ravens. In the 1997 season, Barry Sanders also set an NFL record by rushing for at least 100 yards in 14 consecutive games and shared the league's Most Valuable Player award with quarterback Brett Favre of the Green Bay Packers. After another successful NFL campaign in 1998 which saw him rush for 1,491 yards, Barry Sanders dropped the bomb on the football world by announcing his retirement on July July 28, 1999. He was in the prime of his NFL career (31 years old) and had been injury free so the sudden departure surprised everyone. A couple of years earlier, Barry had signed a 6 year $35.4 million extension that included a substantial signing bonus. He would eventually have to pay part of it back to the Lions as per the judgement of an arbitrator. But apart from the financial and legal wranglings, his departure left many questions of the type of rushing numbers he could have put up. People often began using to his average reception numbers, his play at short-yardage and his inability to block well to play down his greatness. Barry finished second overall in career rushing yards to the great Walter Payton and now sits third overall behind Emmit Smith and Payton. On August 8, 2004, Barry Sanders became the third youngest player ever inducted into the Pro Football Hall of Fame. He was voted to the Pro-Bowl in each of the 10 seasons he played in the NFL. Later that year during the traditional Thanksgiving Day game, the Detroit Lions retired Barry's famous #20 jersey. He continues to call Detroit home for himself, his wife and three children.